USB 3.0 External CD Drives is good choice for your use at home,school and office! 2. This drive is not fully compatible with computers of windows 10 system due to the compatibility issues between windows 10 itself and the external hardwares. We suggested that you download VLC Media player to Play DVD and CD. 3.Before using the CD-ROM drive, be sure your computer has a "Media Player"
If you don't satisfied with it, don't worry, Our company policy is 100% refund for any unsatisfied order for customer. 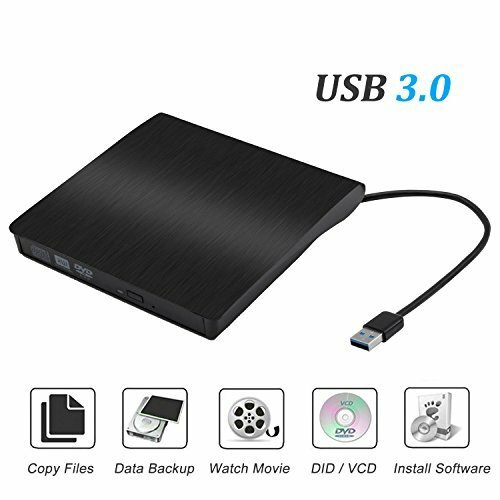 ★ USB 3.0 HIGH SPEED INTERFACE - With This external CD Drives for laptop, it provide you fast data transfer speed and stable performance. You can record CD, music, videos, install software or create CD/DVD backup disc. It is also compatible with USB2.0. ★ GREAT COMPATIBILITY - The CD Drives is suitable for Windows XP/Vista/7/8/10, all versions of MAC OS. It is specially designed for Apple HP Dell Lenovo and others, ultrabook,netbook,laptop and desktop without drive hardware. ★ EASY TO INSTALL & USE - External CD Drives Pulg and paly. There is no need for additional software and extra power supply. Just Plug external DVD drive into your laptop USB interface, press pop-up button and put disc on tray, it will be automatically recognized and play. ★ FASHION DESIGN APPEARANCE - The data cable is hidden into the USB dvd player buner for laptop. It has a slim, lightweight and shockproof design, and stylish enough appearance, you can put this External CD Drive/DVD Writer/Player in the traveling bag or on your desk. If you have any questions about this product by Gipow, contact us by completing and submitting the form below. If you are looking for a specif part number, please include it with your message.